I’ve been in Raleigh for seven months now and I must say, I’m impressed. It’s no NYC, in fact it’s only the 42nd largest city in the States, but in Raleigh’s 140 some odd square miles, it brings a lot to the table. Raleigh has over 12,000 acres of parks. Now I haven’t explored all 12,000 acres, but I have been to several parks, lakes, and running trails. My favorite park by far is Lake Johnson. You can rent a Kayak, Paddle boat, fish, or run around the lake on it’s challenging trails (hello hills). It’s nice to have a variety of options when it comes to running outdoors. Raleigh has such a small town feel. After only seven months, I can’t go anywhere without running into someone I’ve met. Some might hate this, but I love it. Coming from Indianapolis, I would bump into people here and there, but it seems like I see someone I know everyday in Raleigh. I like running into friends at the local Starbucks (I’m pretty sure Sara, Cristina, and Colette pay rent to Starbucks) and joining them for a quick conversation, to sit outside Raleigh Times after work and end up with 5-6 people at your table who were just passing by, and to drive through downtown and wind up seeing friends out for a run. 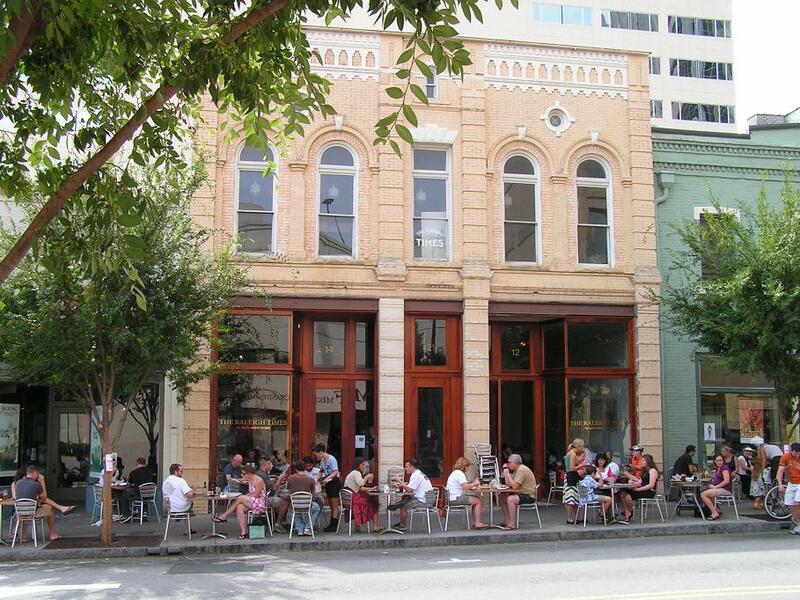 Raleigh has over 850 restaurants to choose from. I can’t tell you the last time I have eaten at a chain restaurant (other than fast food). I don’t even know where the closest Ruby Tuesdays or Applebees are, which is a little disappointing because I have a $25 Applebees card I need to use. 2 for $20 anyone? With all of the mom and pop options in Raleigh, believe it or not there’s not a great place to get a good slice of pizza. Wink. Wink. I don’t think a weekend goes by without a blocked off street downtown due to a festival or event. This town knows how to throw a good street party. Even last night, Fayetteville Street was closed down, carnival rides went up, food vendors lined the streets, and a band rocked the stage. One of my goals for 2013 is to explore more festivals and events throughout the year in Raleigh, especially the World Of Bluegrass event in September. The weather, man oh man, the weather! You can’t beat this weather. You still get all four seasons, but no season is extreme. The winter doesn’t dump 50 inches of snow, and the summer isn’t 100 degrees. Ok, it gets a little humid and sticky in the summer, but drive 2 hours and you’re sitting on the beach. People think I’m crazy though, it drops down to 50 and you’d think everyone lived in Alaska by the way they bundle up, while I’m in a shirt and pants. The entrepreneur and start up community is strong here. A lot of young entrepreneurs taking risks, living sparingly, and hustling every day to make something happen. There are several industry focused incubators like the fashion focused REDii, co-working spaces such as The Hub, and companies like Lumina Clothing. I’ve never been the oldest, ever. My neighbors in Indianapolis were retired and in their 60’s. All that has changed. I’d say the median age of people I’ve met in Raleigh is 25. I’m willing to bet that having a 30,000+ university down the street plays a major role in this, but I’m also convinced that the offerings of Raleigh attract a younger crowd. Feel free to comment on what you love about Raleigh. What I love about Raleigh is what you put in your posts, a friendly community. I've lived here most of my adult life and have always found Raleigh to be one of the most open and welcoming communities. Most of my friends from college and early professional days grew up here and shared many of the cool spots and stories that I always enjoyed learning and listening to. Social media has shown that technology only expands the awesome community and people here. Good post Will and Happy New Year! I couldn't agree with you more Will. I especially enjoy the fact that "Everybody knows your name." Raleigh has the amenities of a larger city but with a small town feel. I've been here 4 months and couldn't be happier. Great article. I have visited Raleigh on several occasions now and am moving my event planning business here in February, so I appreciate the encouraging information on entrepreneurs in the city. I've been very impressed so far with the food, people, and coming from the north I have to add – weather! Raleigh – see you in a month! Thank you all for your comments and compliments on the post!